The disposable PVC RFID bracelet is lightweight and yet packed with a host of features and potentialities, it has a size of 300 mm, suitable for both convenience and style. It is made up of disposable PVC and thus is easy to handle and deal with during and after its usage. To add to all this is the comfortable button lock feature provided with the wristband. 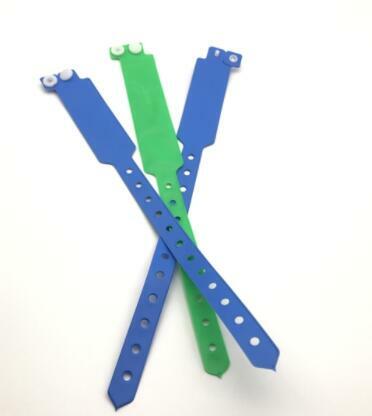 The PVC RFID wristband with one off button can be used in Airport and Post parcel tracking, entrance tickets management for amusement park, swimming pool, patient identification management, mother and infant identification management, prison management, guardianship management, etc. Price and samples info ,please contact :Email:sales@mhgyjs.com.